Why do Dads love Dad Shoes so much? 1. They are leather - Most sneakers are made out of different materials, but your dad knows that leather is the only sneaker worthy material. 2. They are white - My father always told me that if a shoe or article of clothing is black, then it will be very hot once it is exposed to the sun. In other words, if he bought black shoes his feet would roast in the summer time. How do you keep Dad Shoes clean and fresh? 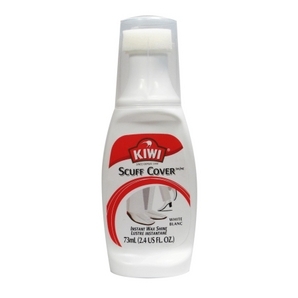 Kiwi Shoe Whitener is best, but any knock off brand will do (see picture below). Where can I get some Dad Shoes? You cannot buy them. They are bestowed upon you when you have your first child. I'm just kidding, you can buy them almost anywhere for about $50. Which clothes go best with Dad Shoes? The obvious choice are jorts (jean shorts), but anything in a medium to very light denim works. Cargo shorts are also acceptable as long as the pockets are completely stuffed with oversized wallets and car keys. The real savage wears Dad Shoes with cargo jorts!